Marchionne: Decision if and how to raise capital will be taken at the end of October. RIMINI, Italy (Reuters) -- Fiat Chrysler Automobiles aims to list shares in the newly merged carmaker in New York on Oct. 13, CEO Sergio Marchionne said on Saturday, adding that a decision on any capital increase would be made at the end of that month. He was speaking a day after the merger between Fiat and its U.S unit Chrysler cleared its last remaining hurdle. Fiat bought out Chrysler at the start of 2014 and both operate as one firm. Marchionne wants to incorporate the two into Dutch-registered entity Fiat Chrysler Automobiles, paving the way for the U.S. listing he says is needed to help finance a 48 billion euro ($64 billion) five-year growth plan. "The most likely date for the listing in the U.S. is October 13," Marchionne told reporters on the sidelines of a meeting in Rimini. He is counting on the merger and the listing to help pay for a relaunch of its Alfa Romeo and Maserati brands, export Jeeps globally, and take all three to fast-growing Asian markets, where the group is currently weak. Marchionne said the five-year business plan for the world's No. 7 auto group presented in May did not envisage a cash call. "But all decision on any capital increase will be taken by the board of FCA at the end of October," he said. He also confirmed the group's full-year guidance for 2014, adding the U.S. market was going "incredibly well." Targets to grow net profit fivefold and sales by 60 percent within five years look ambitious, some analysts say, arguing that the company will have to raise capital to achieve them. Fiat had 18.5 billion euros of cash at end-June, but almost 32 billion in debt. Its financing costs are high and profit margins have weakened. Fiat had so far ruled out asset sales and a share issue, but may go for a mandatory convertible bond. 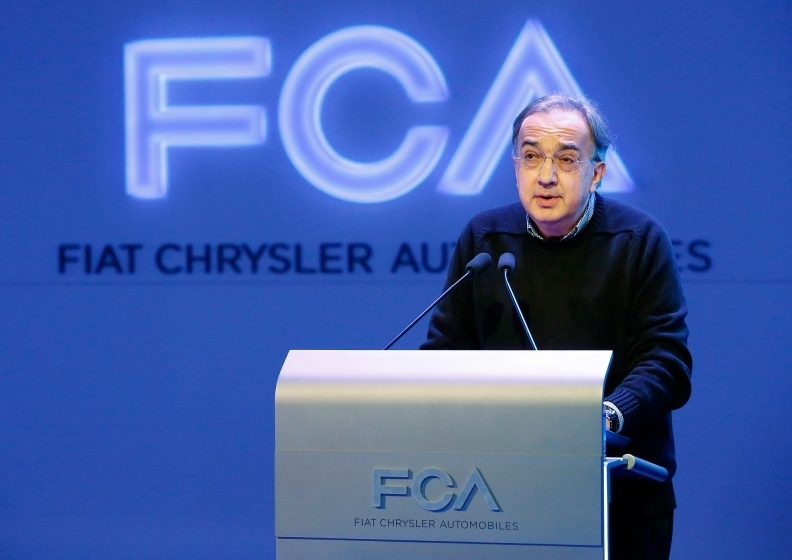 Marchionne had previously said any decision on financing would only be taken after FCA was created. The merger plan could have failed if the carmaker had been asked to pay more than 500 million euros ($658 million) to dissenting investors who tendered their shares, exercising a legal right triggered by Fiat's decision to move its registered offices away from Italy. Fiat said on Friday it was finishing a count of shares for which cash exit rights had been validly exercised, but it could already say that the 500 million euro limit would not be exceeded, based on data calculated so far. It plans to publish the final count by Sept. 4.